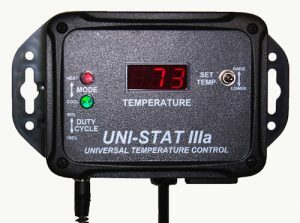 Whether controlling a refrigerator, or running a small pump with a cooling coil, for fermentation temperature control; or, for heating with a 120V element or heating pad, you won’t find a more effective or easier-to-use digital controller than this one. A unique ‘Duty Cycle’ feature provides for optimally smooth temperature control of either cooling or heating modes. All the basic needs, plus simplicity, in this rugged controller – made in the USA, with a 3-Year factory Warranty! Some popular applications include: beer-brewing fermentation, RIMS or BIAB regulation, wine-making fermentation control, wine or beer storage, food storage, chocolate storage, laboratory storage or incubation, space heating, freeze protection of plants or exterior water pipes, and many others you may have need for! This controller in the UNI-STAT series adds to the flexibility and features provided by the UNI-STAT IIa; such as wall mounting, choice of °F or °C, adjustable differential and more. Wall-mounted installation provides excellent user visibility selection. Convenient switch-selectable COOL or HEAT operating mode. No programming required. Unique switch-selectable 50% duty cycle for excellent temperature stability, without unwanted “overshoot” cooling or heating operation. The 50% cycle is 10 minutes ON, then 10 minutes OFF in COOL mode (5 minutes ON, then 5 minutes OFF in HEAT mode), then repeat, until the desired temperature is achieved and your unit shuts off. This feature will automatically switch to 100% duty cycle if the 50% choice is not providing sufficient temperature set-point achievement. Flashing Alarm feature “AL-“ alerts user if sensor temperature is more than 5°F above (COOL mode) or below (HEAT mode) set-point. Flashing alarm feature “Er-“ will indicate a sensor fault, such as ‘open’ or ‘shorted’, and will automatically shut off system until repair is effected. This is easily accomplished with simple plug-in sensor replacement, or possibly on-site repair of the sensor cable. Sensor cable length of 8’ enables flexible system set-up for operation monitoring and control. 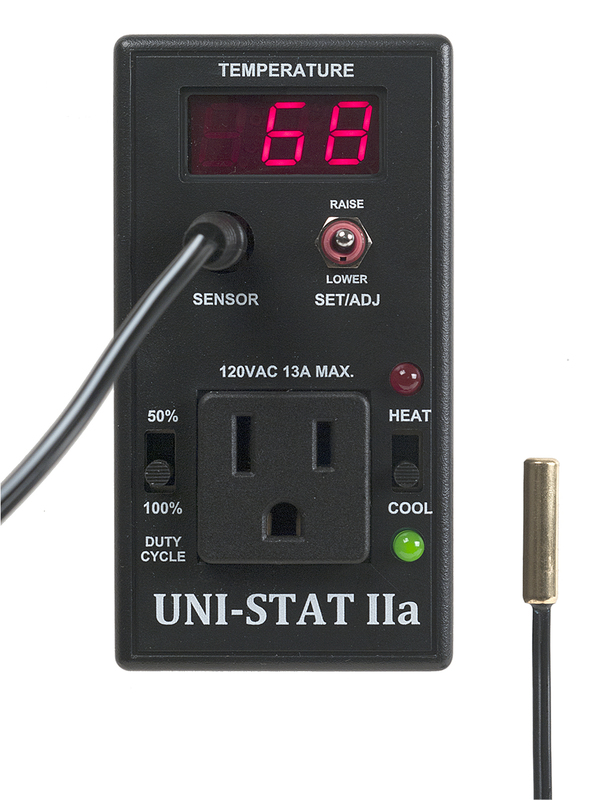 Unit comes with a replaceable general-purpose sensor, which can also be installed in a standard 1/4″ thermowell. 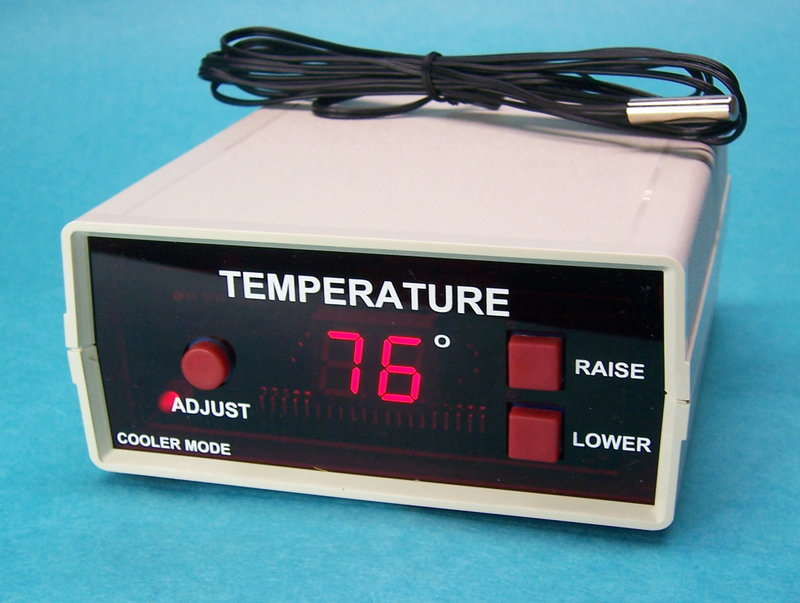 A bottle-probe style sensor is optional, and extends utility of the control to storage use, such as for wine or beer, in a spare fridge, with 1°F temperature stability (see below). Microprocessor accuracy provides +/- 1°F control throughout full range of 10 – 220°F (-12 – 104°C). Simple set-point check or adjustment with one finger toggle, after which all system settings will be briefly displayed for confirmation to the user. Automatic compressor protection is provided in the COOL mode, to prevent possible short-cycling damage. Operating differential (bandwidth) may be adjusted up to +/- 3°F (up to 6° bandwidth). Factory setting is +/- 1°F. Load capacity at 120 VAC is up to 15 Amps (1800W for heating). Designed and manufactured in the USA, and includes a 3-Year Factory Warranty.